Squares are places for people to meet, places where the weekly market is held, and in many cases the focal point of life in a town or city. In the big cities it is in many cases also the place where you find monuments, museums and other special buildings. Of course, almost any major capital has a square, but the more famous and popular ones with names every traveller recognizes, are included here. In the very heart of the Marrakech's Medina is Djemaa el Fna, the busiest square in Africa. Tourists are drawn by day to witness the square's acrobats, dancers, mystical story-tellers, water sellers, snake charmers and musicians. By night tourists are just as plentiful, enjoying the transformation of the square into a huge open-air restaurant as the food stalls kick into gear. Unlike so many other locations, tourism has not taken away from the atmosphere, but only seems to be adding to it. The Djemaa el-Fna is a Unesco World Heritage Site. Durbar Square, a UNESCO World Heritage Site, is located in the heart of the city. This a actually not one square, but three squares linked together. The area is packed with temples and other monuments, but its two most famous features are Hanuman Dhoka, the old royal palace, and Kasthamandap, the wooden house from which Kathmandu takes its name. The Taleju Temple which is overlooking the square is maybe the most beautiful, but is closed for the public. Durbar Square is one of the seven groups of monuments and buildings which display the full range of historic and artistic achievements for which the Kathmandu Valley is world famous. It is of extreme importance regarding the cultural heritage in the country. The seven groups of monuments and buildings, apart from Durbar Square, include Patan and Bhaktapur, the Buddhist stupas of Swayambhu and Bauddhanath and the Hindu temples of Pashupati and Changu Narayan. Tiananmen Square (square of Heavenly Peace) is a large city square in the centre of Beijing named after the Tiananmen gate (Gate of Heavenly Peace) on the north side of the square, separating it from the Forbidden City. On the south side is another gate: the Zhengyangmen or Qianmen. On the square you will find the mausoleum of Mao Zedong, built in 1976. On the westside is the Great Hall of the People, and to the east the National Museum of China. With 440,000 m2 Tiananmen Square is the fourth largest city square in the world. if needed it could hold a massive crowd of 600,000 people. Outside of China the square is mostly known from the protests that took place on the square in 1989. Piazza San Marco, or Saint Mark's Square as it is known in English is one of the famous sights in Venice. Located on one of the lowest points in Venice it is also the first to flood, when the water in the lagoon is rising. On the east side we find the church with the same name, of which construction was completed in 1117. In front of the church it the famous Campanile tower, from which you have a nice view over the entire square and Venice. Next to the church is the Doge's Palace, now a museum, drawing around 1.3 Million visitors each year. The bit of the square in front of the Doge's Palace is called the Piazzetta, and is actually just an extension of the piazza toward the Grand Canal. 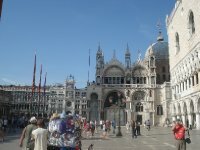 The square is packed with monumental buildings, and statues, of which the winged lion of Venice Is the most important one. Red Square separates the Kremlin, the former royal citadel from the merchant quarter. The square holds Lenin's Tomb, everyday except Mondays and Fridays from 10:00am until 1:00pm. St. Basil's Cathedral, the famous onion-domed church sits to the south end of the square. To the east is the GUM department store, previously known for it's long lines, it now features a number of high end stores. That the red square could also have a function as an airfield was proven by Mathias Rust in 1987, a teenager who flew from West Germany to Moscow without being spotted by the Soviet Radar. Trafalgar Square is located in the heart of London, making it a great place for the occasional celebration as well as a political demonstration. 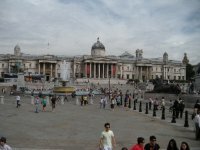 The square is situated in front of the National Gallery, and is named after the British victory over the French and Spanish navy at the battle of Trafalgar during the Napoleonic Wars. The most famous name from that battle is the one of Horatio Nelson, after which Nelson's Column is named, which stands in the middle of the square. Erected in the years 1840 to 1843, it was finished just before the square opened for public in 1844. The big fountains placed in the square were originally not meant to be decorative but an attempt to have less open space, reducing the risk of riots on the square. The 4 lions at the base of Nelson's Column were added in 1876. In 2003 a redevelopment of the square was completed, making it much friendlier for pedestrians. Maybe one of Madrid's most photographed sights is the Plaza Major. This square that dates back to the 16th century, has been used for many things, from markets, fiestas, football matches, to executions and bullfights. Most Spanish towns have a Plaza Major but the one in Madrid is special, because it is completely surrounded by buildings in the same style. If you visit it, also take a good look at the paintings on the north side of the plaza, on the casa de panaderia. Under the arches of the buildings you can find many gift shops, restaurants and an outlet of the Tourist information. The Plaza Major is also the scene of a couple of markets. In the weeks before Christmas and Reyes, there is a Christmas market. 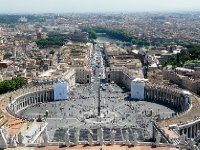 Opinion is divided on whether the colossal St Peter's Square (Piazza San Pietro), which opens on to the basilica, is actually in Vatican City, but for tourism purposes it isn't. You can just walk straight in without passing any checkpoints. It was designed in a classical manner by Gian Lorenzo Bernini in the mid-17th century in the shape of an ellipse attached to a trapezium, surrounded by a double Doric colonnade. Stand at one of the two foci of the ellipse - marked by round plaques in the pavement - and only a single line of columns is visible. The Egyptian obelisk in the middle used to stand nearby in the Circus of Caligula and Nero. From the square thousands of people can see the pope giving his blessings from his balcony. Times Square, which began life as Formerly Longacre, was renamed to its current name in 1904 when the newspaper the New York Times moved it's headquarter to the square, in a tower called One Times Square. It is located at the spot where Broadway and 7th avenue are intersecting each other. An area stretching from 42nd street until 47th street. At the square you will find many lights, making one big commercial display. Since 1907 it hosts the ball drop at New Year's Eve. Zócalo is one of the world's largest public squares (240 x 240 metres). Although the official name is Plaza de la Constitución (Constitution Square), the square is most well-known under the name Zócalo. This name comes from the base that was once built here, and which should support a monument, however the monument was never built, and the base was removed as well at one point, but the name remained. 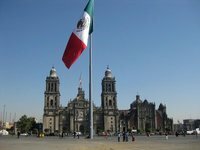 It is home to a massive Mexican flag right in the middle of the square. Every morning and evening there is a ceremony to raise or lower the flag. Bordering the square you will find several monuments, including the Cathedral to the north, the National Palace to the east, the Federal District buildings to the south, the Old Portal de Mercaderes to the west, the Nacional Monte de Piedad building at the north-west corner. Ever since the Plaza de Mayo was the scene of the 25 May 1810 revolution that led to the Argentinian independence, this is the focal point of many Argentinian political events. The square dates back to the earliest dates of the Spanish colonization. Located in the center of the Plaza de Mayo is the Pirámide de Mayo, which rather looks more like an obelisk. It was ordered in 1811 to commemorate the first anniversary of the May Revolution, making this is the oldest national monument in Buenos Aires. 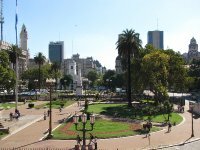 Also around the plaza is the Casa Rosada (The Pink House) which is home and office of the President of Argentina, the National Bank, Buenos Aires Metropolitan Cathedral , and City Hall. This is version 16. Last edited at 18:49 on Feb 5, 14 by Herr Bert. 5 articles link to this page.